It's sweeping the country, but does it lead to more recycled material and less trash in the landfill? It’s “sweeping the country,” but does it lead to more recycled material and less trash in the landfill? I live in Durham, North Carolina, but spend some time in New York City. In my NYC digs I recycle the old-fashioned way — separating plastics, paper and glass, and throwing them into separate bins. But in Durham I just toss everything into a single cart and put the cart by the sidewalk every other week. From there, a truck picks it up and hauls it away, the plastic, paper and glass all jumbled together. And jumbled together they stay until arriving at a materials recovery facility (or MRF, pronounced MURF) where everything is separated out into its various recyclable and unrecyclable components. From some descriptions I’ve read,these plants with their “magnets, ballistic air separators, optical container sorters and aluminum eddy current systems” must be a Rube Goldberg fantasy come true. In the trash biz, we say that NYC uses multi-stream recycling while Durham uses single stream. To be honest, I never really thought that much about the advantages or disadvantages of single-stream over multi-stream recycling. Sure, my Durham persona appreciates the simplicity of single-stream recycling, but my NYC persona doesn’t find the task of separating recyclables into separate bins all that arduous and so it was pretty much a wash for me. Wow, 40 percent is a lot. Is it really that much? I decided to do a little digging on my own. We’ve come a long way, baby, as far as recycling in the United States goes. In 1990 we recycled about 33 million tons and 16 percent of our solid waste. By 2011 (the last year for which the Environmental Protection Agency has data), that amount had jumped more than 2.5 times to ~87 million tons, diverting 35 percent of our waste streamwith more than 60 percent of Americans having access to curbside recycling. Part of that growth has apparently come from the advent of single-stream recycling. 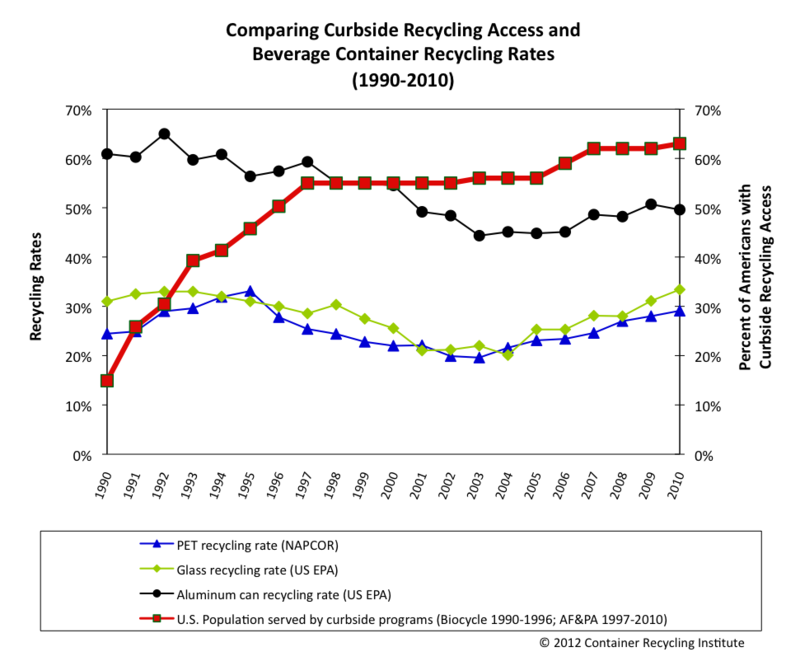 Material recovery processing plants equipped to handle single-stream recycling appearedon the U.S. scene in the mid-1990s, and jumped from just a handful in 1995 to 93 in 2003.While recent estimates of the number of such facilities differ (e.g.,200 in 2009ormore than 160 in 2011) the growth in single-stream processing facilities has clearly come at the expense of multi-stream programs. In 2005 20 percent of recycling communities used single-stream, but by 2010, that had grown to 64 percent. At the same time communities using multi-stream recycling decreased by a similar amount,from 70 percent to 34 percent over the same period. Those are impressive numbers and tend to confirm the 40 percent number cited by Duke’s Arwen Buchholz, but those are not the only numbers out there. There are those that have come to very different conclusions. One such individual is Daniel Lantz, the director of environmental and engineering services at Metro Waste Paper in Toronto. He claims [pdf] that increases seen in collection rates when locales switch “may not be solely due to the single stream collection system, but rather due to a combination of factors [such as] … increased promotion.”And this claim is supported by otherstudies [pdf]that find that increased collections can also be had with dual-stream programs.For example, the city of Berkeley in California was able toincrease its tonnage and keep a dual-stream by providing larger carts. But let’s leave the question of increased collection aside and consider another issue: how much material actually gets recycled versus how much ends up in a landfill. Just because more stuff gets collected in the recycling bin doesn’t mean more stuff gets recycled. And there is a good deal of data to suggest that it does not. It probably does not surprise you to learn that not all the stuff we place in recycling bins is actually recyclable; and not all the recyclable material in those bins gets properly sorted out and sent on its recycling way. The stuff that shouldn’t have been put in the bin and the stuff that could have been recycled and wasn’t are known as residuals and it all gets sent to landfill. And guess what: single-stream systems generally produce a lot more residuals than multi-stream. According to the Solid and Hazardous Waste Education Center,residual rates [pdf]are roughly 1 percent for multi-steam systems, 2-3 percent in dual-stream systems, and a whopping 15 to 27 percent for single-stream systems. That’s right: More than 10 times more residuals come from single-stream systemsthan multi-stream. Still, all things being equal, if collections in single-stream systems are 50 percent larger (and as noted above, that’s a big if), single stream is still a winner even if 20 percent more goes to the landfill. But wouldn’t you know it, all things are not equal. Once stuff leaves the recycling plant, it heads to re-processors, paper mills and bottle makers who use the material to make new products. The re-processors don’t just care about quantity, they care about quality. If the recycled material is of inferior quality, they’ve got problems. And it would appear that many in the re-processing business are none too happy about single stream recycling. So why the rush to single-stream recycling? Could it be that it’s cheaper for a municipality (or for a university) to run a single-stream operation. If so, the question we need to ask ourselves is if those are real savings. Certainly not for the re-processors: “The cost savings for a municipality from single-stream collection show up as cost increases for the processors and recyclers.” And if the processor and recyclers are paying more, so are we consumers. But the real concern is the landfill. I would hate to think we’re saving money for municipalities and paying the price at the landfill. * Studies [pdf]show that increased collections can also be had with dual-stream programs.For example, the city of Berkeley in California was able toincrease its tonnage and keep a dual-stream by providing larger carts.